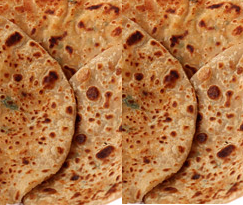 Home Paratha How to make Ajwain Paratha? India 9 October 2016: We all love parathas, don’t we. Ajwain Paratha is a healthy version of the good old parathas. Ajwain is considered to be very healthy and is used in Ayurvedic and Unani medicines. Ajwain parathas go well with pickles, chutney and curd. To make the ajwain parathas, in a clean plate take the wheat flour. Now add a little warm water to the flour and make it lumpy. Next add the rest of the ingredients and continuously mix it along till its fully converted into dough, which is ready to make Parathas. Let the paratha dough sit aside for 20 minutes. Later make small dough balls out of it and roll it out into a paratha. Put this rolled paratha on the tava and cook it properly from both the sides. Your Tasty and healthy Ajwain paratha is ready to be served.